Otter is a playful, joyful animal that is very protective of its young and is at home on land or in water. As a power animal, Otter stresses the need for compassionate understanding, balanced judgment and generous sharing. Otter helps you not only to be willing to share the good things of your life with others, but also to find pleasure in other people’s achievements and good fortune. If you are happy for others you will find more joy in your own life. Otter is an antidote to worry and anxiety. It emphasizes how important it is not to concern yourself too intensely with acquiring more material “goodies” or advancing your position career-wise. Otter encourages you to find satisfaction in what you have and to enjoy life rather than to merely tolerate it. Enjoy. The medicine held by Otter is a set of lessons in female energy. This applies to both men and women, as all of us have female sides. 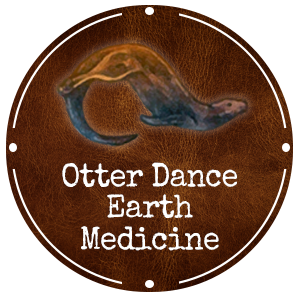 The Otter’s hide is very often used to make medicine bags for powerful women because it represents balanced female energy. Otter is very caring of its young and will play for hours, performing all types of acrobatics. It lives on land, but always has its home near water. The elements of Earth and Water are the female elements. At home in both of these elements, Otter is the personification of femininity: long, sleek, and graceful. Otter is the true coquette of the animal world. Otter is always on the move and is very curious. Unlike other animals, Otter will not start a fight unless it is attacked first. This joyful little creature is adventuresome and assumes that all other creatures are friendly – until proven otherwise. These character traits are the beauty of a balanced female side, the side of ourselves that creates space for others to enter our lives without preconceptions or suspicions. Otter teaches us that balanced female energy is not jealous or catty. It is sisterhood, content to enjoy and share the good fortune of others. Anchored in the understanding that all accomplishments are worthwhile for the whole tribe, Otter people express joy for others. Long ago, in tribal law, if a woman were widowed, her sister would offer her own husband to the widow as a lover to keep her from drying up and not using her creative urges. This is Otter Medicine, too. Envy, or the fear of being replaced has no space in Otter’s balanced understanding of sharing goodness. Woman energy without games or control is a beautiful experience. It is the freedom of love without jealousy. It is the joy of loving other people’s children and their accomplishments as much as you love your own. It may be time to examine your feelings about sharing the bounty of your life with others. Otter may be saying that the finer qualities of woman need to be striven for in both men and women so that a unity of spirit can be achieved. This would involve the destruction of jealousy and all the acts of anger, which stem from that fear. It would mean keeping a Hawk-eye on your ego and maintaining total trust. It would mean a world full of people coming together to honor the right of each person to be. If you have drawn this symbol, Otter may be telling you to become the playful child and to simply allow things to unfold in your life. It may be time to stop your addiction to worrying. Otter also teaches the importance of not hanging onto material things that would bind you or become a burden. In looking at how you can learn from. Otter’s habits, you might look at the joyousness of the receptive side of your nature. Have you given yourself a gift recently? Have you received any messages in your meditations? Become Otter and move gently into the river of life. Flow with the waters of the Universe… this is the way of balanced female- receptive energy. Honor it! In doing so, you will discover the power of woman. Laugh at your antics. Balance work and play. Reclaim vulnerability.